Manipay is an age old prominent hamlet in the Jaffna peninsula which was famous for its heritage of eminent philanthropists, statesmen, scholars, diplomats, devoted professionals, businessmen and industrialists. Kumarasamypillai of Manipay was that first unofficial Tamil member of the Legislative Council in 1833. His son, Sir Kumarasamypillai Muthu Coomaraswamy, a distinguished son of Manipay was the first Asian to receive the Knighthood from Queen Victoria. His son, Dr. Ananda Coomaraswamy was a renowned archaeologist and anthropologist. He interpreted the art and wisdom of Asia to the world. He travelled extensively in South Asia and revealed that there had been intimacy among all races in the region. It is the language and the distance that have separated them. The two nephews of Sir Muthucoomaraswamy, Sir. P. Ramanathan and Sir P. Arunachalam have played a key role in public life during the pre-independence era in Ceylon. The Green Memorial Hospital was founded by one American missionary, Rev. Dr. Samuel Green. This was the first teaching hospital for western medicine for doctors in Ceylon. Dr. A.C. Hall alias Kumaru was one of the six students recruited for training by Dr. Green. After a period of initial training from 1851 to 1853 at Green Memorial Hospital, he proceeded to Vellore Medical College, India to complete the medical degree. On his return Dr. A.C. Hall was the first Ceylonese to be appointed as Obstetrician and Gynaecologist to Green Memorial Hospital and its branch Macleod Hospital (Maternity) at Inuvil, Chunnakam. It is in this wealth of stately heritage, a son of the soil, W. Sangarapillai, philanthropist and a successful businessman founded Manipay Hindu College on 4th July 1910. The land was donated by him. The foundation stone was laid by Sir Joseph Hutchinson the then Chief Justice of Ceylon. I was a student of this institution from 1946 to 1955. On January 4th, 1946, I gained admission to Manipay Hindu College and it was the most memorable day in my life. The students and the teachers assembled in the Hutchinson Hall and were eagerly waiting for the arrival of the Principal, V. Veerasingham to address the gathering. At 9.00 am. Sinniah, the soft spoken, unsophisticated peon rang the College bell. There was pin drop silence. A stocky, dark, curly haired, meticulously dressed, majestic figure, Principal Veerasingham was ushered into the hall. In his speech while welcoming the new students, he emphasised that all students should observe three "Golden rules" in life to enable them to become useful citizens of the country. q Students! you should learn to respect the feelings of others. q Be magnanimous, conduct yourself with decency and decorum and maintain good public relations. 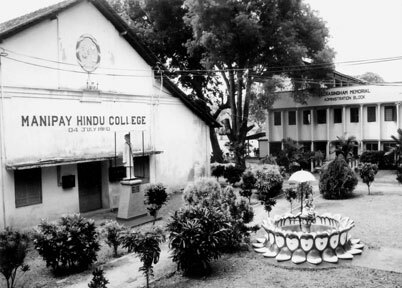 Manipay Hindu College is 100 years old and has a rich history. The centenary celebration falls today, July 4, 2010. There are many sons and daughters of Manipay and its environs who have been through the portals of this college are holding responsible positions in various disciplines in Sri Lanka and developed countries - U.K, USA, Canada, Australia and the European Union. Nineteen principals of the College have guided the destinies of the institution for the last 100 years. Its progress has been largely due to the untiring efforts of six past principals - Pandit V. Mylvaganam (Swami Vipulananda), V. Veerasingham, K. Muthivetpillai, M. Perairavar, S.T. Chari, C. Kesavarajah and the present Principal S. Sivaneswaran. Pandit V. Mylvaganam, was the Principal of Manipay Hindu College for a period of two years from 1921 to 1922. V. Veerasingham B.A, J.P., MBE was the first old student to be appointed as Principal for 29 years from 1922 - 1951. Under his inspiring leadership the College grew rapidly and soon became one of the leading institutions in the country. Students excelled not only in education but also in sports and other extra-curricular activities. Four of his students became professors in the University of Ceylon, Professor K. Kularatnam - Geography, Professor Nadarajah - Law, Professor Hoover - Biochemistry and Professor A. Sinnathamby, Obstetrics - Gynaecology. Senator Nadesan, an eminent lawyer and C. Mahendra were also old students of Manipah Hindu College. Two of his students took up business as their career. A. Subramaniam, a pioneer in Hardware industry, was the Managing Director of Mascons Limited and Asbestos Cement Industries Limited. He was an amiable gentleman and had the character, courage, industry and perseverance and achieved his goals with remarkable success. Deshabandu Albert Athisayaratnam Page, a Fellow of the Institute of Chartered Accountants of Sri Lanka and a Fellow of the Institute of Chartered Secretaries and Administrators, London was the Chairman of Ceylon Theatres Limited, Cargills Limited, Millers Limited and Managing Director of C.T. Land Development Limited, the key developers of Majestic City, a standing monument for skills and dedication to serve the country. He had acute and penetrative business acumen. He extended his business reach in diversified fields with outstanding success. Subramaniam and Page were helpful particularly in developing their alma mater, Manipay Hindu College. Subramaniam provided adequate funds to construct a vocational training centre for students and Mascons Block with classrooms. In accordance with the last will of Page, a Memorial Hall was constructed and the funds was provided by him and his children. These three buildings are a monument for their realised vision. Mudliyar Mahesan, J.P. was a philanthropist. He has contributed largely to the development of Manipay parish. He was also a devoted member of the Board of Directors of manipay Hindu College. V.S. Thurairajah, a distinguished old student of the College, studied architecture in Bombay and England. He established his private practice under the name of Thurairajah Associates in 1964. He has made significant contribution to architecture for over a period of forty years in Sri Lanka and overseas. * V.S. Thurairajah Open Air Theatre. Old students of Manipay Hindu College are indebted to the institution for imparting the wealth of education, enjoyment of sports and culture, apart from inculcating noble values in life. The Old Students Association of Manipay Hindu College, Colombo appreciates the vision and mission of the founder W. Sangarapillai, who 100 years ago decided to build the institution as a tribute to Manipay parish, where he was born. We wish the college Godspeed and all success for the future. The writer is the President of Manipay Hindu College, Old Students Association, Colombo branch, Sri Lanka.